The Camargue White Storks watch over the region from their nesting area in the Parc Naturel Regional de Camargue, Provence in France. The Camargue white storks breed in the wetlands of the Parc Naturel Regional de Camargue in Provence, France and usually migrate in winter to the tropical climate of Africa. Large wading birds, the White Storks can have wingspans measuring up to 200 centimeters, and they build nests of sticks above ground in trees or platforms (built by park workers). A pair of White Storks scan the area while spending some time at their nesting grounds. White Stork, Ciconia ciconia, in a nest with chick, Parc Naturel Regional de Camargue, Plaine de la Camargue, Camargue, Les Bouches du Rhone, Provence, France, Europe. 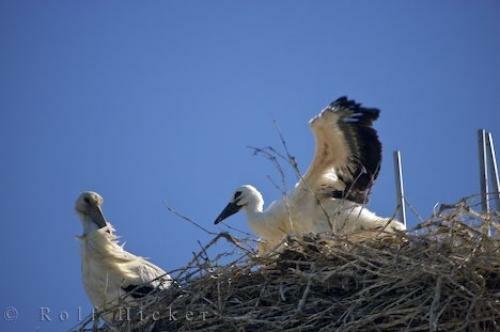 Photo of White Storks nesting in Parc Naturel Regional de Camargue in Provence, France in Europe.